Important: For comfort, safety and durability, please ensure a snug fit (tighter than traditional collars) by leaving just enough room for 1 little finger to fit between cat's neck and collar. A collar that is not fitted properly can cause safety issues for the cat. Our collars are made for adult cats, not suitable for kittens. Kittyrama collars fit neck sizes between 7.7 inch - 10.4 inch (19.5 cm - 26.5 cm). After much development and trials (with our cat Lily and her pickiest cat friends) our award winning cat collars are ready to style every furrytale. What makes our cat collars the best in the land? Slim, Breathable, Waterproof: Helps protect the neck area from moisture and heat, for less chances of irritation. Perfect fit: Easily tailor the fitting to your cat's neck via the buckle with holes (just like you'd do with a watch strap). Our patented design won't let the fitting move with wear, keeping the cat collar on the right setting day in and day out. Ultra safe: All our cat collars feature quick release break away clasps, so a tough snag won't stop your cat from finding yet more mischief to get into. Timeless designs: The bright colors won't lose their spark, and the strap won't fray with wear. Recommended by experts: Kittyrama collars are the first ever cat collars to receive a 'Cat Friendly' award by International Cat Care, the global charity for the welfare of cats. Talk about feeling like the cat that got the cream. 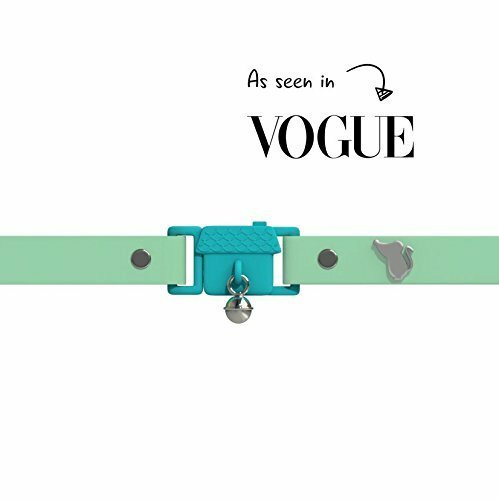 Super Stylish: As seen in British Vogue magazine (April 17 edition). We are so confident your cat will rock them so much, we are sorry in advance for any increase in cattitude. Purrfect customer service: Please contact us directly with any queries or issues, we'll reply quickly and won't scratch. Winner of International Cat Care Charity's 'Cat Friendly' Award, after being assessed by a panel of over 20 cat experts. Comfy and Lightweight - Cats forget they have them on, thanks to the soft and smooth collar strap. Slim, Breathable and Waterproof - Helps protect the neck area from moisture and heat, for less chances of irritation. Quick release breakaway clasp opens at forces over 5.5lbs. For adult cats. Fits neck sizes between 7.7 inch - 10.4 inch. From Kittyrama, as featured in British Vogue magazine (April 2017 edition). If you have any questions about this product by Kittyrama, contact us by completing and submitting the form below. If you are looking for a specif part number, please include it with your message.